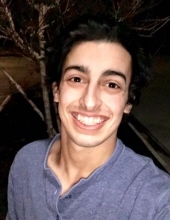 Ivan Puello, 21, of Paragould Arkansas, passed away on February 8, 2019. Ivan was born in Marianna, Florida on May 29, 1997. He graduated from Greene Co. Tech and continued further education at ASU. He enjoyed family, hiking, listening to music, being an uncle, being a humble artist, working out, playing soccer, and making everyone laugh. He was such a hard worker and spent every day caring for everyone, family or friend. Ivan is preceded in death by his grandparents; Gladialisa Puello, Luis Puello, and Jose Ramon Lora. He is survived by his parents, Ricardo and Rosario Puello; his siblings, Fr. Alejandro Puello, Gabriel Puello, Lucia Hale, Laura Branch, and Emmanuel Puello; his nieces and nephews, Andrew Hale, Karlie Hale, Chloe Hale, Molly Hale, Patrick Hale, Lucy Hale, and Elise Branch, and other family and friends. Visitation and Rosary will be held at 6:00pm on the 10th of February at Heath Funeral Home. The funeral Mass will be held at 10:00am the 11th of February at St. Mary Catholic Church. Fr. Jack Vu will be officiating. Burial will follow the funeral mass at St. Mary Cemetery. Funeral Arrangements are being handled by Heath Funeral Home. To send flowers or a remembrance gift to the family of Ivan Puello, please visit our Tribute Store. "Email Address" would like to share the life celebration of Ivan Puello. Click on the "link" to go to share a favorite memory or leave a condolence message for the family.